Pandora is quite an inquisitive Goddess Girl—but she could stand to be more cautious. Pandora is one of the few mortals at Mount Olympus Academy—and probably the most curious of all the students in school. Her quizzical nature is famous—not that she thinks there is anything wrong with being curious, of course! 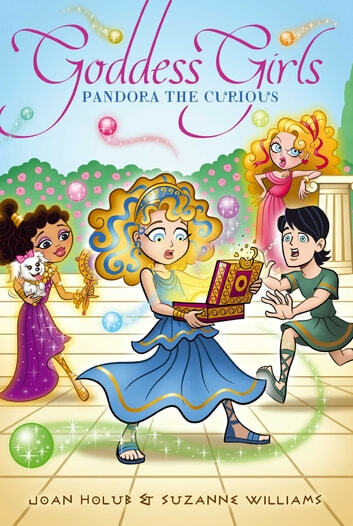 When a godboy named Epimetheus brings a mysterious and fantastical box to school, Pandora’s curiosity is piqued. And when it unexpectedly lands in her lap—literally—she can’t help but take a look at what’s inside. What could be the harm in that? But little does she know that opening the box will open up more trouble than she thought…. My Sister the Vampire #4: Vampalicious! My Sister the Vampire #2: Fangtastic! My Sister the Vampire #3: Re-Vamped! What Was the Gold Rush? What Was the First Thanksgiving? What Is the Statue of Liberty? I liked it because if the curiosity of Pandora and how the Characters usual character traits as they do in the books before and in the book also. It is quite the adventure. I "iked this book because of the suspension at the end of each chapter and the characters are so intreging i just never wanted to stop reading.